State of Oregon Acting Governor Kate Brown has been elected as Governor of the state, making her the first openly bisexual governor to be elected in the United States. Brown, 56, hid her sexuality for years, NPR reported. In the 1980s, when she was starting out her career as a lawyer, she was afraid that her sexuality would be exposed. Although she was seeing a woman at the time, Brown went on to marry Dan Little in 1997. However, in the mid-90s she was outed following the release of a story featuring LGBT legislators. 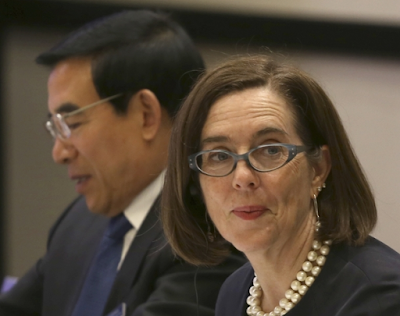 She stepped in as governor of Oregon in February 2012, after former Gov. John Kitzhaber resigned over an influence-peddling scandal. She was secretary of state at the time; as Oregon does not have a lieutenant governor, she was first in the line of succession. "Now, she'll serve the remaining two years of the four-year term Kitzhaber won during the 2014 election," Oregon Public Broadcasting reports. Brown was not the first bisexual people to serve as a governor — former New Jersey Governor Jim McGreevey came out as gay in 2004 and resigned months later. But she's likely most well known for being the first openly LGBTQ governor in the US. "I believe that the times call upon us to take action, and I believe that if we work together we can shape both the place and the times in which we live. 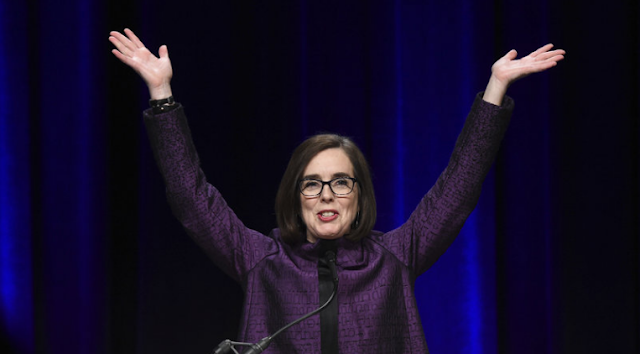 Let's work together to make Oregon, our home, a place where everyone can thrive," Brown said in a speech following her win Tuesday night. Prior to her victory, she stated that even if she won the election Tuesday, she intended to run for bisexual governor again in the subsequent election.